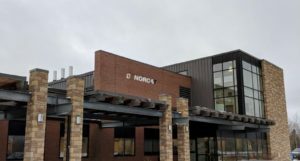 From November 14-15, our Technical Team made their way to the NORCAT Training Centre in Sudbury. The first class slated for WipWare trainees Marty, Tom and Andrew was the Working at Heights training modules which lasted through the day. At the end of the program, the trainees quickly made their way to the computer room to do some final online multiple choice tests. Everyone passed with flying colours. 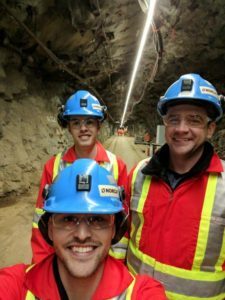 The second day of training had our technical specialists heading to the NORCAT Underground Centre. 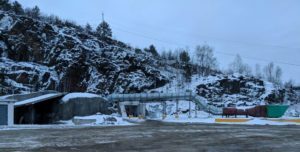 This training facility was formerly Fecunis, a production mine owned and operated by Falconbridge (Xstrada Nickel). It was established in the 1940s and has been taken over by NORCAT as an underground training centre for students. It is located about an hour northwest of Sudbury, past Chelmsford and towards Onaping, ON off of Highway 144. The day was spent in an underground classroom watching safety videos and slides, as well as sharing pertinent anecdotes about how safety saves lives. There was also a brief tour and a sounding and scaling demonstration and our technicians had an opportunity to experience how dark it is underground when the lights go out. It was an interesting exposure for Marty, Tom and Andrew, and a great team bonding experience for the Technical Specialists to get to know one another. Plus, the team is fully prepared for an underground experience should one arise.